Typical of Eleven’s run, these are all mediocre episodes with some great stuff and some really not great stuff. None of the stories is especially effective. We have a salvage crew causing implausible levels of damage to the TARDIS, three brothers with an uncomfortable relationship, and secrets. We have the unflinchingly evil Mrs. Gillyflower and her plot to wipe clean the Earth and begin her own Eden. We have a planet infested with rapid-upgrade Cybermen. None is particularly compelling. In the plus column, first place goes to Matt Smith’s performance against himself as the Cyber-planner. Gaiman wrote the episode specifically to showcase his skill, and it works beautifully. The man is a terror and a wonder, and his face has been the absolute highlight of the season. The continuing ‘impossible girl’ arc remains a problem, and the Doctor’s obsession with secrets. “Secrets keep you safe,” he says, except that they don’t, and while Clara wisely observes this, she still goes along cheerfully with his plan to erase her memory. I would expect her at least to extract a promise to be honest with her – not that I would then expect him to keep it, but it would be nice if people faced consequences for treating each other poorly. Let me get this straight: You think that your client, one of the wealthiest, most powerful men in the world, is secretly a vigilante who spends his nights beating criminals to a pulp with his bare hands; and your plan is to blackmail this person? Good luck. I do really enjoy the interior TARDIS shots, the Cybermites, and the Paternoster Gang. I appreciate the parallel between Ada and her monster. I wish we could get more than a second or two of Action Jenny. I had forgotten that ‘Hide’ was so much fun. We start with a classic haunted house ghost story, full of thrills and chills, tempestuous weather, and terrifying smeary old photographs. Jessica Raine (best known for Call the Midwife and ‘An Adventure in Space and Time,’ in which she plays the otherwise inimitable Verity Lambert) and Dougray Scott make a gorgeous Doctor-companion parallel. Clara gets some excellent character stuff; Matt Smith’s face is a work of art; and the rescue of Hila Tukurian and the unnamed monster make a pair of grand adventures. Down sides include cattiness between the TARDIS and Clara – completely out of character for the Doctor’s oldest friend, in my opinion – and service to the ‘impossible girl’ arc. I’d be perfectly happy with the Doctor and Clara deciding to play ghost hunter for a bit – there’s a lovely ‘Tooth and Claw’ feel to some of their scenes together – without any need for the Doctor to go tracking down an empathic psychic to spy on Clara for him. But both are minor in the end; the love-story wrapup, complete with semi-subtle 10th Doctor/Rose nod, is very sweet, if a bit wanky. Still. A ton of fun, which I did not recall at all. ‘Cold War,’ on the other hand, I found a bit of a snoozefest. A heap of discombobulated ideas mashed into something resembling a story. The pair of nods to the Second Doctor era – the Ice Warriors and HADS, or Hostile Action Displacement System – are fun, and I appreciate the attempt to recreate a little ‘Hunt for Red October’ 80’s cold war feel – not to mention ‘Alien’ – but altogether I don’t think it was very successful. No character gets a reasonable throughline. Nothing at any point makes any sense. It all just feels like a mess. A fine idea, but ultimately a failure. Sorry, Mr. Gatiss. Better luck next time. With this pair of episodes, I observe that I prefer to watch the Doctor deal with something he doesn’t know than something he supposedly does. In ‘Hide,’ he has no prior experience of either Tukurian or the mysterious creature trapped with her in the pocket universe; he figures them out as he goes. In ‘Cold War,’ however, he knows the Ice Warriors from prior televised adventures – fine – but also professes to know something of Skaldak personally, knowledge of which fans have no experience. There’s nothing wrong with the Doctor knowing things we don’t know he knows, of course; but pulling things like Skaldak out of thin air, when there’s so much actual relevant show history to work with, annoys me. It would be much more interesting, for example, to learn about Skaldak by talking to him; then we and the Doctor could learn together, and the adventure would feel more like sharing something than being pulled around by the nose. 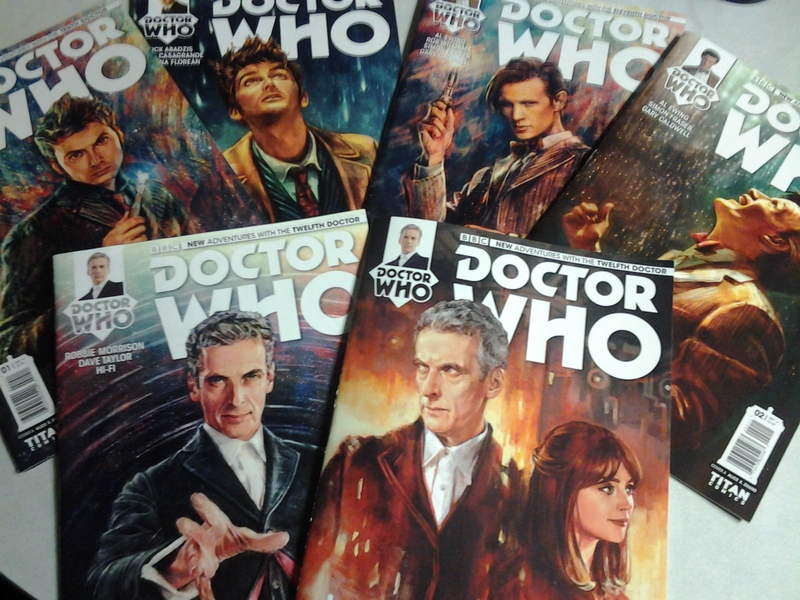 These are Alice XZ’s Doctor Who comic book covers. As much as I would love to buy and read Doctor Who comics regularly, it’s an impractical medium. 5 minutes of story once a month at $4 a pop adds up too fast. But Alice XZ covers I can justify collecting. ‘Virtuoso,’ now officially licensed by the BBC. There are of course many more. On the comics front, I’ve enjoyed what I’ve read. The Eleventh Doctor’s stories in particular capture the character well. His companion is an excellent one. (Nothing against Clara or Gabby Gonzales, but Alice is special.) The interior art leaves something to be desired; likenesses are iffy. I don’t mind limiting myself to the Alice XZ covers. However, I will be collecting the Ninth Doctor. His run is only 5 issues long and includes Rose and Jack. How can I pass it up? ‘Dinosaurs on a Spaceship’ is a decidedly mixed episode. On the one hand it is extremely silly. Tricey plays fetch and gives rides. Rory’s dad carries odd things in his pockets. Mitchell and Webb voice the robot sidekicks. But on the other hand, we have mass slaughter, human trafficking, hostage-taking, and, ultimately, what may be the Doctor’s first up close and personal on-screen murder. There are plenty of things to like about the story. I like the idea of Silurians running away from death by asteroid, with an ark of Silurian-era flora and fauna to seed a new world. (I wonder if this is a different branch of the family from those who stayed sleeping underground.) I like the Indian Space Agency. I like Amy and Nefertiti asserting themselves. I love Rory’s dad: coming to terms with the impossible, sharing tender moments with his son, overcoming his personal reluctance to see the world. But there are a few uncomfortable moments, and some strangeness. Nefertiti’s behavior in the opening scene bothers me in the same way Amy’s does in ‘Flesh and Stone,’ and Martha’s in ‘Smith and Jones.’ Solomon’s treatment of her is likewise a little too unsettling for family television. In addition, the Doctor is confusing. He left Amy and Rory behind for their own good after ‘The God Complex,’ and hasn’t seemed to mind paying them occasional visits when the mood strikes him. Now he has apparently changed his position – at the same moment that they have changed theirs, in spite of Amy’s expressed unwillingness. Is she giving in to Rory after their difficulties in the prior episode? Is she ready to give up the Doctor for him? And has the Doctor now realized he doesn’t want to do without them, regardless of the risk to their lives? Ultimately, it doesn’t matter. It’s a strong episode, fantastical and sweet and adventurous. The characters are great, even if Nefertiti and Riddell are drawn a little thin. The ideas are good, and the acting is excellent. Another good outing by writer Chris Chibnall. I only wish we’d gotten more Brian. How is Amy’s faith in the Doctor so weak that a single conversation is sufficient to destroy it? She spent more than half her life waiting for him. She believes in him utterly, as we saw in ‘The Beast Below.’ We know from ‘The Girl who Waited’ how tenacious she can be. She doesn’t let go easily. (Until she does – see Rory in ‘Asylum of the Daleks.’) Up to this point we have no reason to think her confidence in him is any less solid than, say, bedrock. And we’re supposed to believe a lame half-truth would blow it all away? I’m not a fan of religious themes, but setting that aside, I do think that Doctor Who is in a large way a show about faith. No matter what happens, the Doctor always believes in his core that everything will turn out. Time after time he wins against impossible odds. Even when there are losses to face, the enemy is always ultimately defeated, and the heroes go home better than they were before. The Doctor believes in himself, he trusts to luck, and he knows he can count on his friends in a crisis. That belief is one of the driving forces of the show. Several episodes of the modern era specifically examine faith. ‘The Impossible Planet/The Satan Pit’ is a prime example. The Doctor expresses his faith in Rose openly – “I believe in her” – but he also demonstrates faith through his actions. Specifically, he destroys the urns, supposedly sentencing himself and everyone on the rocket to death by black hole, only to come up against the TARDIS in the rubble. Rose also expresses her faith in the Doctor by refusing to leave without him. She knows he isn’t dead; it would take more than a few words from Zach to persuade her otherwise. ‘Gridlock’ is a different kind of episode about faith. The people of New Earth believe in the system; they believe someone is looking out for them, and someone will save them. The Doctor knows this isn’t true. The world above is dead, and there is no one coming. However, by his efforts he becomes that someone. Their faith is justified. It might not have been the salvation they expected, but salvation it was nonetheless. The Doctor’s hand, they may suppose, was moved by God. Another kind of faith turns up in the same episode: Martha’s faith in the Doctor. Now some fans may feel differently, but I find this faith strangely misplaced. Like Amy in ‘The Beast Below,’ she hasn’t known him very long, but already she trusts him with her life. Maybe it’s because of that relationship she’s built up in her head. Maybe it’s bad writing. Or maybe it’s normal, and I’m just slow to trust. Martha, and Donna after her, never lose their faith in the Doctor. Rose and Clara have theirs shaken when he changes his face before their eyes. Rose’s is quickly restored by her charming new friend, while Clara has been kept off balance all season, particularly when the Doctor abandons her in ‘Kill the Moon.’ But in each case the trial that moves the mountain has some weight. Neither would likely accept the Doctor’s words so easily as Amy. And the truth is, neither would Amy. ‘The God Complex’ is not Toby Whithouse’s strongest script, but it is not without its moments. The idea is solid and interesting. Rita is wonderful; I agree with the many fans who wish she could have stayed, and wonder why she never even got so much as a last name. Rory, fearless and faithless, continues being great. The visuals and music are weirdly cool. The resolution – the Doctor leaving his friends behind to preserve their lives – is a new one for the show. Maybe it’s the Doctor’s faith that was shaken. It wasn’t Amy losing her trust in him; he lost his trust in himself to keep her safe, and that’s what killed the monster. That would make a believable ending.